Sunroof, Heated Seats, Rear view Camera, 9-Speaker Alpine Audio System with Subwoofer, Uconnect 3C with 8.4 Display! Compare at $63745 - Our Price is just $61888! Whether you're on the job site, around town, or making a long haul on the highway, this Ram 3500 gets the job done. This 2017 Ram 3500 is fresh on our lot in Mission. This Ram 3500 Heavy Duty delivers exactly what you need: superior capability and exceptional levels of comfort, all backed with proven reliability and durability. Whether you're in the commercial sector or looking at serious recreational towing and hauling, this Ram 3500 is ready for the job. 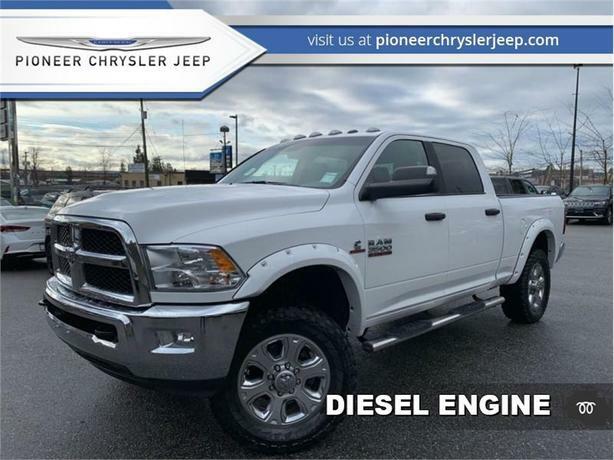 This sought after diesel crew cab 4X4 pickup has 50318 kms. It's bright white clear coat in colour. It has a 6 speed auto transmission and is powered by a 383HP 6.7L Straight 6 Cylinder Engine. This vehicle has been upgraded with the following features: Sunroof, Heated Seats, Rear View Camera, 9-speaker Alpine Audio System With Subwoofer, Uconnect 3c With 8.4 Display, 20 Inch Aluminum Wheels, Rear Park Assist. It has some remaining factory warranty for added peace of mind. Our 3500's trim level is SLT. Our Ram 3500 SLT offers a great blend of features and value. It comes with great features like a Class V hitch receiver, 18-inch chrome clad wheels, power windows, power locks, power mirrors, heavy-duty Hotchkiss rear suspension, a chrome grille, an anti-spin rear differential, and remote keyless entry. To view the original window sticker for this vehicle view this http://www.chrysler.com/hostd/windowsticker/getWindowStickerPdf.do?vin=3C63R3DL2HG752158. / Total cost of borrowing $13020 ). See dealer for details.